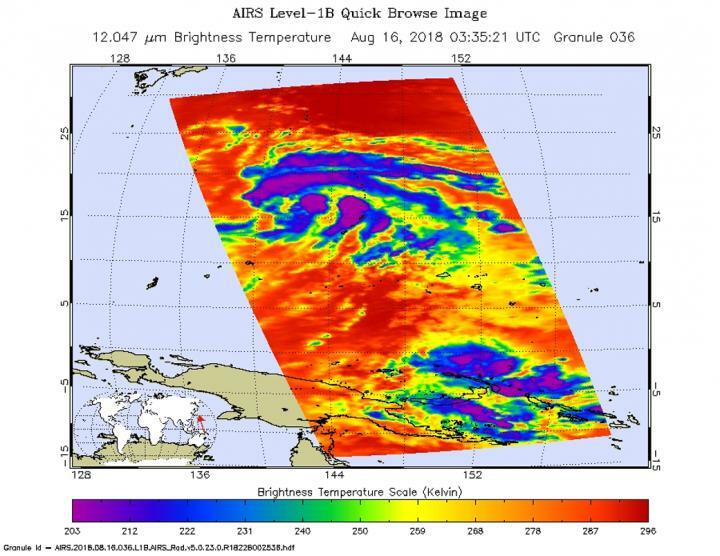 When NASA's Aqua satellite passed over recently developed Tropical Storm Soulik in the Northwestern Pacific Ocean it analyzed temperatures in the storm. NASA's Aqua satellite passed over Soulik on Aug. 15 at 11:35 p.m. EDT (Aug. 16 at 0335 UTC). The Atmospheric Infrared Sounder or AIRS instrument analyzed the storm in infrared light which provides temperature information. Temperature is important when trying to understand how strong storms can be. The higher the cloud tops, the colder and the stronger they are. AIRS saw coldest cloud top temperatures around the center of circulation and in a thick feeder band north to northeast of the storm's center. Those cloud top temperatures were as cold as minus 63 degrees Fahrenheit (minus 53 degrees Celsius). Storms with cloud top temperatures that cold have the capability to produce heavy rainfall. The Joint Typhoon Warning Center or JTWC noted on Aug. 16 at 11 a.m. EDT (1500 UTC) that Soulik was centered near 18.5 degrees north latitude and 141.8 degrees east longitude. That's about 379 nautical miles south of Iwo To Island, Japan. Soulik was moving to the north-northwest and had maximum sustained winds near 63.2 mph (55 knots /102 kph). Soulik is forecast to move north then turn to the northwest. The system will intensify into a typhoon, potentially threatening Japan.